A band-saw mill cutting slabs from a big white pine tree. Wooden boats have souls. No, I’m not getting metaphysical on you, necessarily. 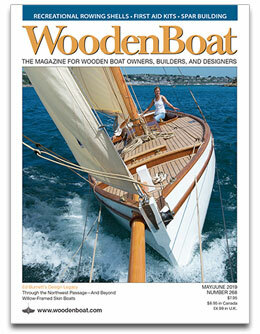 But think about it: Wooden boats are made from organic, living trees, by hand, each one unique. Each piece of wood is, to me, a minor miracle of life on earth—beautiful, strong, flexible, unique, alive. I own a small sawmill, locally-made here in Maine. It consists of a big horizontal band saw on a 24′-long steel railway. I fell trees with a chainsaw and saw them into the wood I need for building boats, houses, furniture, musical instruments and longbows. Each log from each tree presents the challenges of how to orient it; how to mill it; how to eliminate knots, rot pockets, and bends; and how to saw it for desired grain orientation. After sawing it, I air-dry the milled timber for one year, minimum, before milling it into usable lumber. I make posts and beams for timber-framed houses and barns, and plank stock for everything else. I used to be a California hippy—a certified tree-hugger. Even though I have been a carpenter since boyhood (I started building boats at age 12), I have always harbored some guilt about butchering trees. After all, they are living things. They are the lungs of Planet Earth. When I moved inland to Appleton, Maine, after living on the coast, I was confronted with the necessity of whacking trees. Murdering hundreds of them! My land here is “climax forest,”—uncut for 70 or 80 years—the first trees to come in are dying out, and the shade-tolerant trees are fully mature. There are so many trees here, from tiny saplings to huge oldsters, that you could not walk three feet without running smack into a tree trunk. Cutting was going to be essential for building even a driveway and campsite, to say nothing of a house and barn, plus a field for a garden and fruit trees. So I learned to murder trees in large quantities. And I hated it. This has made me acutely aware of every piece of wood that passes through my hands. Some pieces of wood are so beautiful that I stare at them. Some I set aside for my boatbuilding partner Bill Smith, who uses them in his beautiful five-string fiddles. When I find a piece that follows one growth ring for several feet, I set it aside for making longbows. Most pieces become planks for wall-framing, flooring, V-match tongue-and-groove wall covering, door and window casings, cabinetry, and furniture. And some pieces I mill for use in boatbuilding. My double-ended sharpie schooner IBIS contains ash and wild black cherry milled from the trees on my land. I used ash for ceiling planking, countertops, deck and coachroof beams, hatch carlins and even belaying pins. I used cherry for cabinet doors and drawer faces, fiddle rails, bunk boards and trim. Every piece of that wood started as a tree. For the first time in my life, I got to implement the whole process of working with wood, from felling the tree to applying eight coats of varnish. Making ash belaying Pins on a lathe.. So a wooden boat is made from living things. But it is also made by living things. I have come to believe that every wooden boat absorbs some of the life-energy of the people who build her. A large part of her constitution consists of the love, hate, joy, frustration, blood, sweat and tears of her builders. And we do put all of that, and more, into our wooden boats. A piece of our human soul, if indeed we have one, goes into every boat we build by hand. 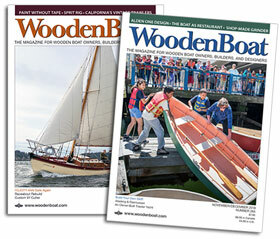 Wooden boats “feel” alive. They move differently. No mass-produced “thing,” popped out of a mold from synthetic materials has even remotely similar properties. Ask any avid sportfisherman—almost all prefer a cold-molded wooden boat to any other. (And no, I am not a fan of sport fishing!) A boat made from toxic chemicals that comes out of a mold is a “clone,”—a soul-less thing. With the souls of wooden boats comes responsibility. Our personal energy is incorporated into our work. If we are negative and angry while building a boat, that negativity will be absorbed in the finished product, even if it is beautiful. If we work with love and care, that positive energy will be part of the result, even if it is less than beautiful. Hence, I always tell my clients to “enjoy the process” of boat-building; to work with care and thoughtfulness, if not love. All too often I do not live up to my ideals—I don’t always practice what I preach. I am often a cranky worker. When we were building my lorcha T’IEN HOU, Delfine and Davina [two of Reuel’s Angels] were working on deck and I was down in the bilges, when a terrible string of vulgarity exuded from my foul mouth. Davina, new to Parker Marine, looked at Delfine in shock, and Delfine told her “Don’t worry—he probably just dropped a screw.” It’s always the little things that push my buttons. When something major goes wrong, I typically don’t say anything—I just deal with it. IBIS’s tiller, sawn from a grown ash crook. Because of this flaw in my character, I try to sit down with my boatbuilding project at the end of the day—especially if I have been particularly bad—and talk to her over a bottle of Guinness stout. I apologize for my negativity, and tell her that she is beautiful, that she has a soul, and that I really do love her! I can only hope it helps….